One begins with a preliminary interest in spiritual advancement and a conviction that material pursuits will never yield true happiness or perfection. 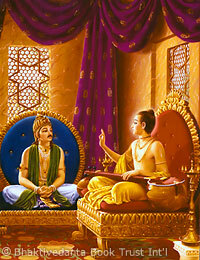 One then associates with persons advanced in Bhakti. In the next stage one becomes initiated by an elevated spiritual master, under whose instruction one begins to practice devotional service. By executing devotional service under the guidance of the spiritual master, one becomes free of all material attachments and all habits that impede one's spiritual progress. Thus, with realized knowledge, one attains unshakeable faith and steadiness. And one acquires an insatiable thirst for hearing about and serving the Supreme Person, Sri Krishna. Gradually emotions for God intensify to the point of spiritual ecstasy. Finally one awakens pure love for Krishna, which enables one to see Him face to face, to speak with Him, and to live and enjoy with Him eternally.